Used primarily as a support tool for Cansema (Amazon) Tonic III, Cansema® Bloodroot Capsules are a potent blend of three anti-cancer herbs: Bloodroot (Sanguinaria canadensis), Pau d' Arco (Tabebuia impetiginosa), and Cat's Claw (Unicaria tormentosa). The "on-label" dosage is one capsule daily. The use of Tonic III and Cansema Bloodroot Capsules replaces our earlier reliance of Cansema Capsules (see below) and CanSupport (later Botanical Support) products. with Cansema Tonic III, a stronger formulation, recommended in its place. 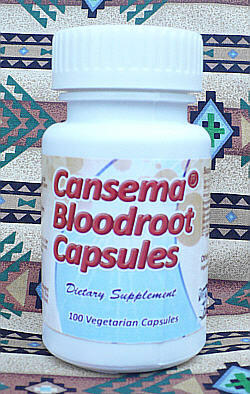 Important Note: Cansema Tonic I was reintroduced Sept. 14, 2001, to complement Cansema Capsules and the highly concentrated Cansema Tonic III (#803). You can view specifics on Cansema Tonic III on its separate page, and be sure to read the new FAQ questions comparing the three internal versions of Cansema and their relative properties. As always, email us if you have further questions. The formulas were further refined in working with other practicing master herbologists. We feel that our resulting "nutritional supplements" make an important adjunct to other nutritional supplements or pharmaceuticals used by cancer patients and sufferers of a wide range of viral infections. Our customers must agree: despite our generous money back guarantee, few individuals have taken advantage of it. Each ingredient services an important function and contributes to the overall efficacy of the formula. Below we list the important herbs which are the basis of the botanical extracts contained in our internal Cansema products. Chaparral (Larrea tridentata, Larrea mexicata) -- An herb long reverred for its miraculous medicinal properties by Indians of the Southwest U.S., chaparral's secret is known to be contained in a substance known as NDGA (nordihydroguauretic acid). This organic anti-oxidant is the basis of several recent cancer cures which have been filed with the U.S. patent office, most by Chemex Pharmaceutical of Fort Collins, Colorado (USA). The FDA has granted drug status to Chemex for a remedy for a pre-cancerous skin remedy (actinic keratosis) which uses NDGA as its base. Our products contain specially harvested chaparral which have been specimened and known to contain 16-18% NDGA by weight for maximum concentration. Galangal (Alpina officinalis) -- A relative of ginger, the root of galangal is effective in making the actions of Cansema products milder to the stomach. It is also a suporific, helping to cleanse the system through perspiration and acting as an adjuvant to the overall action of chaparral. Rhubarb (Rheum palmatum) -- Rhubarb root is a potent tonic; in the concentrations contained in Cansema products it also acts as an astringent to counteract the laxative effects of a number of the compounds. Burdock (Arctium lappa) -- The root is used in Cansema products as a detoxifier, diuretic and mild laxative--it is frequently used by herbologists in their treatment of cancer sufferers. Buckthorn (Rhamnus frangula) -- The action of aged buckthorn bark is similar to rhubarb and serves as a synergistic adjuvant. Red Clover (Trifolium pratense) -- Red clover blossoms, like chaparral, contain cancerolytic hydroquinones. A tea made from red clover blossoms has been widely reported to help reduce tumor size in a great many people. In Cansema products, it works together with chaparral and purple lapacho. Purple Lapacho is a South American botanical, and like red clover, is used because of its hydroquinone concentration.  Zinc Glutomate / Zinc Chloride are used to impart zinc, which work as an adjuvant. It is not known why zinc increases the antineoplastic and antiviral activity of NDGA, but the effect has long been known. Ascorbal Palmitate is a combination of ascorbic acid and palmitic acid. This fat soluble version of Vitamin C is added to increase the overall effectiveness of NDGA--both of which are anti-oxidants. This formula may cause nausea or an emetic response in some users. Always, always take with meals. Vomiting indicates that the dosage is too high. Reduce. If problems persist, discontinue use. Purgatives in the formula may cause diarrhea for some users at the beginning of use. This should pass within a few days. If not, discontinue use and see your naturopathic physician. Pregnant women should AVOID using this formula--as it may act as an abortifacient, or otherwise harm the fetus.